Explore your romantic side with the ICE Resin® artists in The Romance of Mixed-Media Jewelry eBook. Find a variety of mixed-media jewelry with a romantic antique flare that will have you inspired to create your own romantic mixed-media jewelry. This book is just $10! And is packed packed packed with project after project centered around ICE Resin's Rue Romantique bezels. 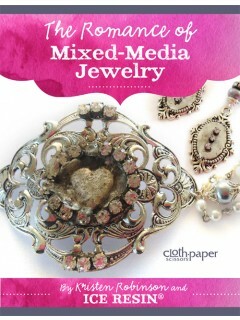 Every project has instructions and beautiful photos for you to refer to in making your own romantic mixed media jewelry. « Target 1 Spot Strikes Again!